Review posted April 18, 2015. This book is hard to describe. It's a book for adults which relies heavily on illustrations. The author is an art director and a designer. He uses images and text to explore the question: What do we see when we read? What do our brains experience? Do we catch all the details? 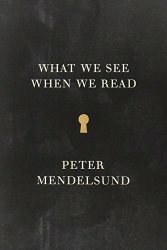 What's going on in our brains and in our senses when we read? If I said to you, "Describe Anna Karenina," perhaps you'd mention her beauty. If you were reading closely you'd mention her "thick lashes," her weight, or maybe even her little downy mustache (yes -- it's there). Matthew Arnold remarks upon "Anna's shoulders, and masses of hair, and half-shut eyes. . . "
But what does Anna Karenina look like? You may feel intimately acquainted with a character (people like to say, of a brilliantly described character, "it's like I know her"), but this doesn't mean you are actually picturing a person. Nothing so fixed -- nothing so choate.